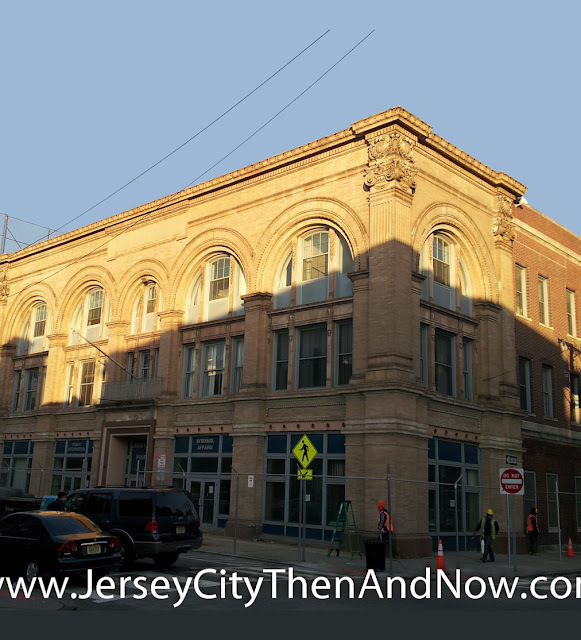 The north side of Newark Ave, between Erie and Grove Street has retained a lot of turn-of the century buildings and their architectural details have been restored. The south side is a different story though... Several buildings have been torn down and replaced with one story retail spaces. However, if looking closely at the three buildings that are nearest to the photographer on the right hand side in the photos above, it is probably the 19th century buildings that are still standing. These three buildings have exactly the same total (as well as floor height) as the buildings in the old postcard, and it likely that they just had their original facades covered up in the 70s or 80s. Also, if you visit what is currently the 'C H Martin' store (third building on right-hand-side) you will notice that the ceiling is a tin ceiling on the ground floor - suggesting the building would be significantly older than the facade would have one believe. 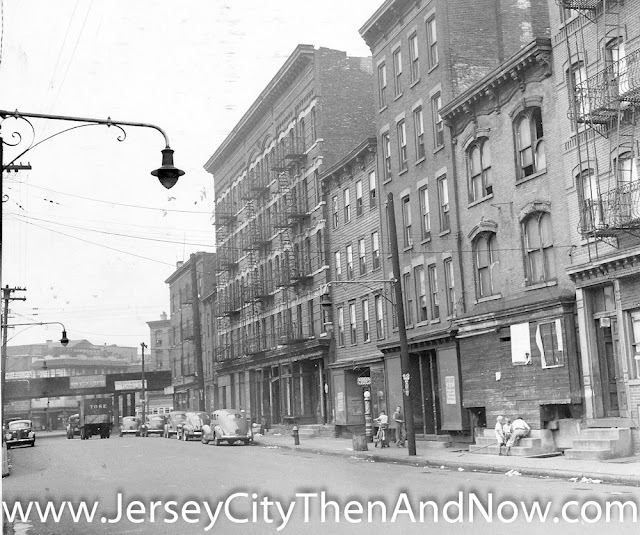 Imagine if the facades of these buildings were restored to their former glory - that would be an important step towards revitalizing this whole section of Newark Ave.
You should be able to use the green handle in the middle of the picture above to show more or less of the old and new pictures. In recent versions of Firefox and Internet Explorer you should be able to click on the green handle in the picture and (while still holding down the mouse key) drag it from left to right to show more or less of the old picture. In other browsers you may need to single or double click on the image, to make the slider move to the location where you clicked. The old picture is from circa 1900. 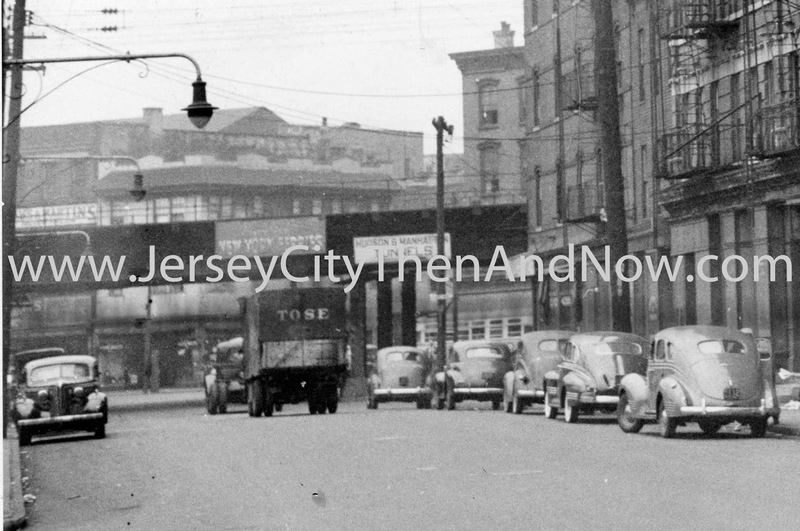 At that point the building on the north east corner of Newark and Grove (the building in the foreground of the picture) was a Drake Business College. The old pictures has so many interesting details and activities going on - street vendors, horse drawn carriages, 'old school' merchandising in glass cabinets outside the stores, etc. 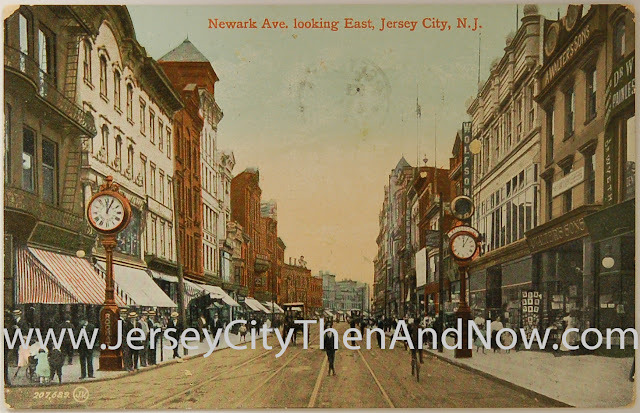 At that point there was an extensive trolley system in place in Jersey City - at the time of the picture they were horse drawn, but a switch was later (c:a 1910, I believe) made to electric trolleys. The sign on the building behind the trolley is advertising toys - there also seems as if there is a larger than life sized statue of something that looks like Santa on top of the canopy. On the furthermost building in the picture there is a mural advertising Omega Oil. Some of these buildings were torn down when Grove Point was built, while others had been demolished long before. 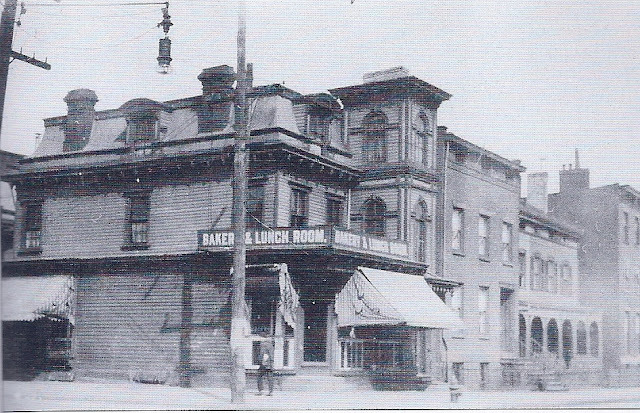 This Second Empire / Victorian building on the Corner of Wayne and Barrow used to house a Baker and Lunch establishment. Note the gas street light in the top left hand corner of the older image - every night these street lights would be manually lowered and lit. 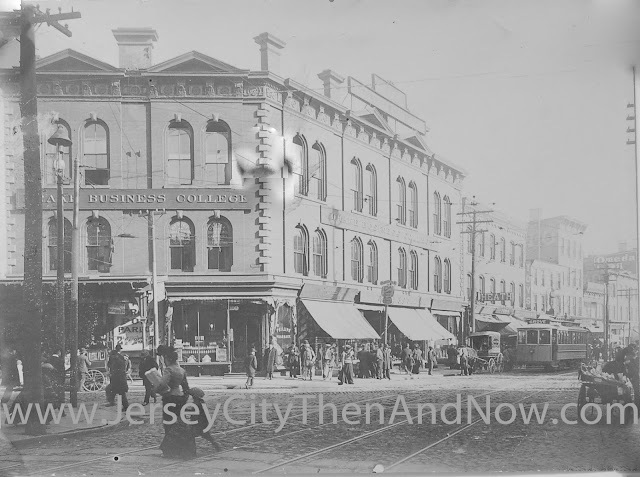 Based on configuration of windows, door and stoop I believe that the building that currently stands to the right of the corner building is the same as in the old photo. It just seems as if another floor was added. Next to that the wooden building has given way to a parking lot. Apart from the mansard roof, there is not much that today gives away that this used to be a beautiful building. 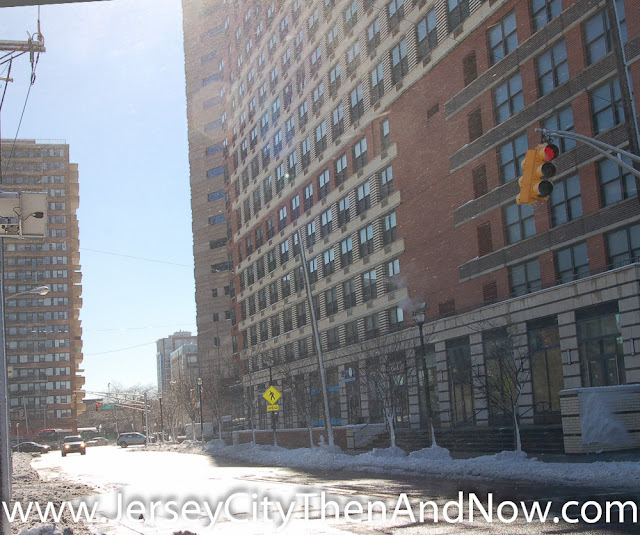 The building was labeled 'unlivable' by a Jersey City agency in 2012, and no visible improvements have been made over the last 10 years. As it is unoccupied and deemed unlivable, it's likely that it will deteriorate quickly from this point onwards if nothing is done to save it. 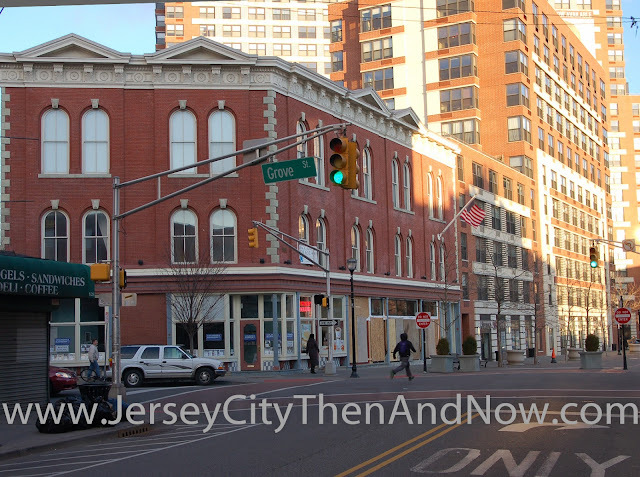 In 2004 a plan was drawn up to redevelop the block, under the 'Columbus Corner Redevelopment Area' and I believe this plan involved restoring the building. More details here (second half of article). But nothing ever came of the plan. Even though the building is in 'less-than-great' shape, it can still be saved and restored to it's former glory. 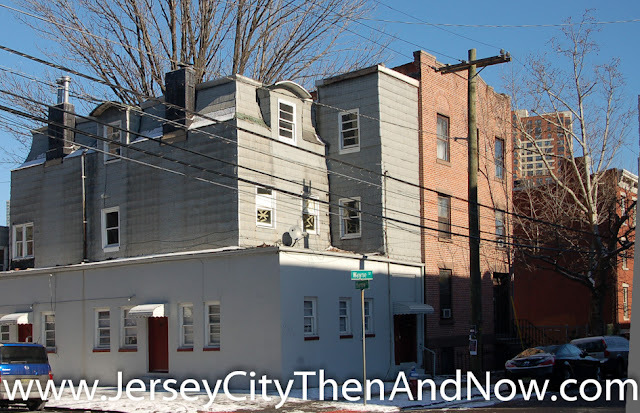 An example of how this can be done is 241 Seventh Street, in DT JC. A local developer took what was a condemned building, gut renovated it and restored the facade in historically sensitive way that blends in very well on the block. I hope this is what in the end happens to the building at Barrow and Wayne St corner. 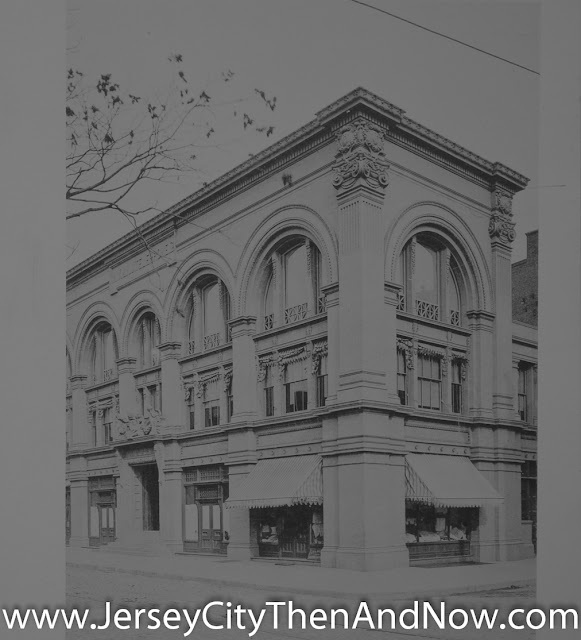 The old photo comes from Jersey City Free Public Library's awesome collections in the 'New Jersey Room'. But I must confess that rather than obtaining the copy directly from the library, I scanned it from this book on Jersey City. 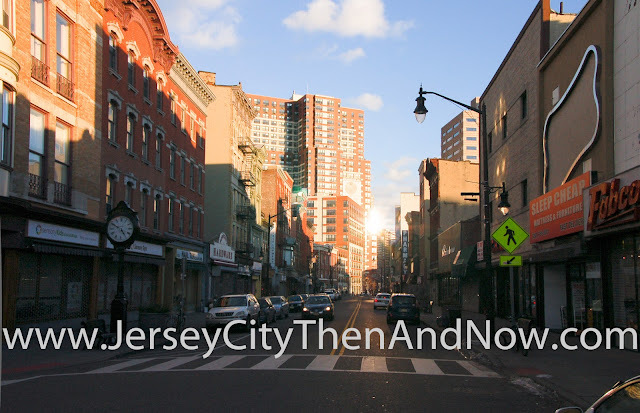 The book is a good introduction to what Jersey City's various areas used to look like. When I find the time I will try to obtain a copy directly from the library and upload it here - the picture quality should benefit.